Possible the trip to Lands End. The meetings were held in Perranwell Sunday School. 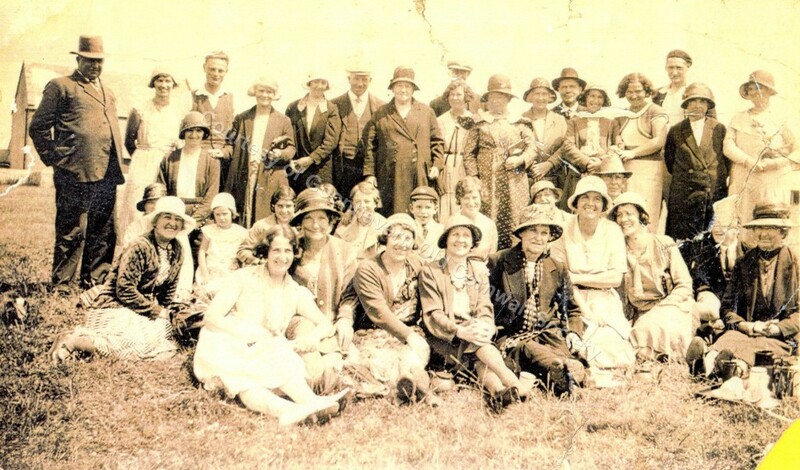 Back Row: William Harding, Liley Bown, Raymond Ellery, Minnie May, Olive Bodilly, Charlie Bodilly, Bessie Bodilly, Estelle Bodilly & boyfriend, Mrs Charley Bodilly (Perranwell), Mrs Brock & Mr Brock (Temple – Goonhavern), Unknown, Hazel Trenerry (Callestick), Unknown, Alma Sobey, Fanny Ellery (Perranwell), Ann Thomas (Newquay) sitting on chair. Middle Row: Unknown, Unknown, Pat Bown, Beth May (Perranwell), Unknown, Doreen Ball (Lanteague Lane), Ronald Grubb (Reen Cross), Miss Alford (Lanteague Lane), Mrs Hawkey & Mr Hawkey (Railway Houses). Front Row: Daisy Richards (Belvoir), Mrs Cleave (Reen), Margaret Penna, Elsie Mitchell (Rose), Laura Jane Grubb & Gertie Grubb (Reen Cross), Madge Grubb (Truro), Ellen Tonkin (Perranwell).